As one of the three military departments operated by the U.S. Department of Defense, the Army’s main function is to fight and contribute to the victories of our nation’s wars. It’s quick and continuous land control, which spans across all combat areas, is the heart of the Army’s operations. Being able to successfully organize, equip and train its forces to achieve this goal is a feat often recognized using Army challenge coins. 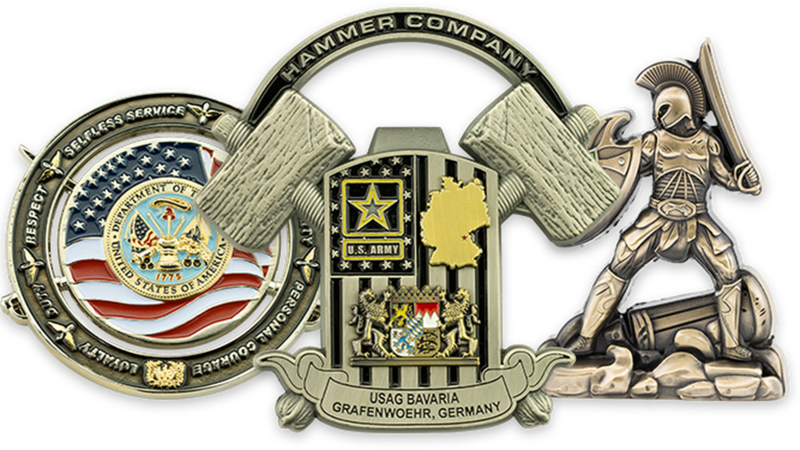 Challenge coins made to celebrate the completion of training, a change in rank or receipt of special honors and awards are some of U.S. DOD Coins most common military coin requests. We have also seen Army coins used to mark specific events or periods of time and make remembrances of companies, units and platoons something tangible. U.S. DOD Coins is an exclusive challenge coin company who provides custom made challenge coins, of the best quality, with the most design options, in the fastest time and at the best price to the individuals, groups and organizations that should get them first. Throughout their long military history, service members of every rank, at any of tour of duty and within all MOS’ have experienced the feelings of pride and belonging that only military challenge coins can bring. If you, your unit or department have not yet experienced or would like to know what it feels like to have your very own custom coins, we cordially invite you to take part in this rich military tradition.